Bart loses his last baby tooth in a spitball fight. Called the money tooth, Bart is suffering from what he calls a midlife crisis when the tooth fairy has given a gift in his name to the United Way, what his mother calls a "grown-up gift." 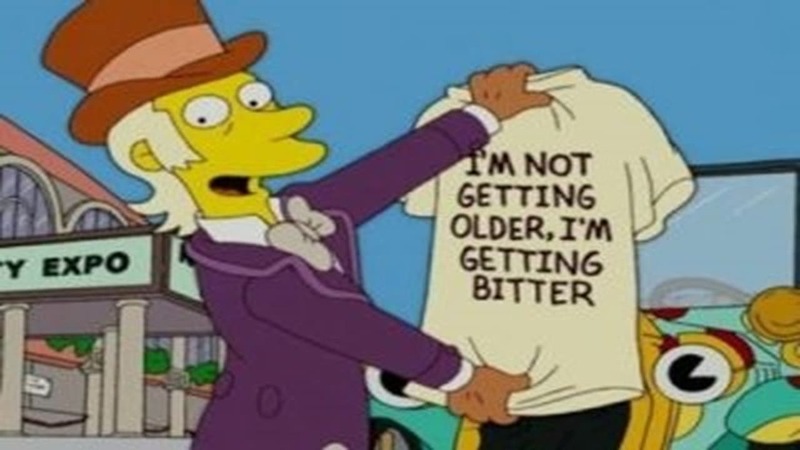 Bart gives up on his childhood and Lisa suggests that he expresses his feelings in some way and Bart chooses to put them in the form of slogans on a T-shirt. When Goose Gladwell, a gag-gift entrepreneur, sees the slogans he forms a partnership with Bart that begins to make Bart a lot of money. Homer is suspended from work without pay and then decides to quit outright and live off of his son's earnings. Of course he loses his place in the family as breadwinner and starts to lose his self respect. A documentary by Declan Desmond on lions inspires Homer to start focusing on his relationship with Lisa. He decides to help her with her science project about nuclear power, which includes a scale model of the first nuclear power plant. Homer improves on her model by making it functional, something easily done after finding the instructions on the Internet. He sneaks into the power plant and get some plutonium. Meanwhile, Goose Gladwell has sold the rights to Bart's T-Shirts to Disney and Bart won't get a dime from it. To get back into his role as the alpha male of the family, Homer makes use of the working nuclear reactor to threaten Gladwell into giving his son what he deserves and few novelty items for himself. As to whether the reactor actually works or not, Homer decides to leave that up to the seagulls at the city dump to figure it out.